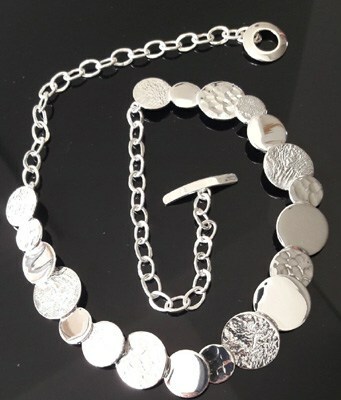 Weighing 39g, this is a top quality handmade silver necklace. 17 inches long it will sit gracefully on or just below your collar bone. Fully Assay office hallmarked with the chain being 6mm wide and the alternating textured discs, being a maximum of 16mm wide. There is a lot of work in a necklace like this and the price is amazing value for money. Will be one to pass down in the family because of its quality.